Did I ever tell you the story about how my son used to hate avocados, but then his friend made guacamole on a trip, guilted my son into trying and LO AND BEHOLD, he suddenly liked avocados? Well, that’s what happened. And I know for a fact that the guacamole recipe that converted my son from a guacamole hater to a guacamole lover was very, VERY simple. 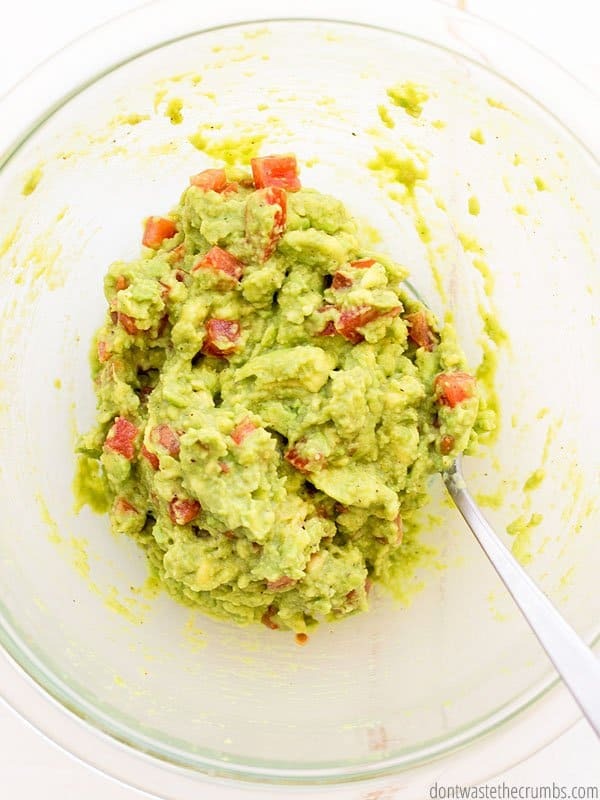 Ever since, I’ve been whipping up this simple guacamole recipe and licking the bowl clean. Good thing the Whole30 lets me eat all the all the avocados I want! The last time my dad visited, we went grocery shopping. Perhaps not exciting for you, but for a chef and a food blogger, it was quite the event! Among the items on my list, were avocados for guacamole. Dad: You need red onions, right? Dad: (with a concerned look) Jalapenos? Me: Nope. Just avocados. This is a SIMPLE guacamole, and I have the tomatoes at home already. Me: You can make your guacamole however you want, but I’m making a SIMPLE guacamole recipe. But I promise it’s going to be good. Here’s the thing. There are a lot of different types of guacamole, depending on the person you talk to. You’ll find people who like guacamole that’s smooth and creamy… and then there’s people who like it chunky. Some like it mild, with barely any spices at all… then some like it hot, with several varieties of spices and peppers to light your WHOLE mouth on fire. You could even go the savory route with caramelized onions and garlic if you wanted to! And that’s what makes this particular simple guacamole recipe so awesome. I’m giving you the framework of a truly delicious guacamole that you can tailor to whatever your preferences might be. Want ultra-creamy and smooth guacamole? Process the avocadoes in a food processor or blender and add sour cream. Skip any mix-ins that will tinker with the texture. Want chunky guacamole? Mash the avocadoes with a fork and spoon until it’s as chunky as you want. Gently fold in your mix-ins to preserve the larger pieces of avocado. Want a super mild guacamole? Follow the seasonings in my recipe below, but HALVE them. If it’s not seasoned enough, add more, but remember that you can’t take the seasons back out. Want a kick-your-pants spicy guacamole? Add chopped Serrano chilis, chopped jalapenos or even cayenne pepper. Remember that the more wrinkly a pepper, the hotter it is! No matter what your guacamole preference is, start with this simple guacamole recipe and you can’t go wrong. Speaking of this recipe, what makes it so simple? Honestly, there’s not much to it. 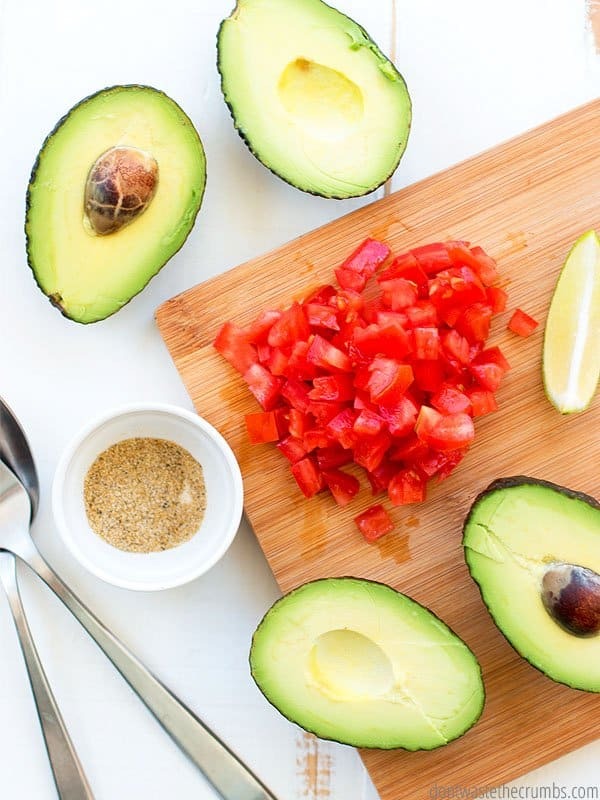 A couple avocados, a tomato (which is very much optional), a squirt of lime juice (not optional) and a few spices you have in your pantry are all you need. Tomatoes: Dice a whole tomato or quarter cherry tomatoes – either way works just as well! Salsa: Red or green would be great. We love our homemade red salsa, and salsa verde (like the kind we use on chicken and spinach enchiladas) is super yum. Peppers: Jalapenos, Serrano and bell peppers would be good too – it all depends on the level of heat you want. And if you roast them in the oven first, you get bonus points. Onions: Use whatever you have – white, yellow, red, green, shallots… you can sauté them ahead of time or keep them raw. You really can’t go wrong either way. Cilantro: I ABSOLUTELY LOVE cilantro, but I know not everyone feels the same way. The leaves are pretty, but there’s flavor in the stems too. I’d add the stems to the food processor (if you go the creamy route) to ensure they’re super tiny. Did you know you can freeze guacamole? Freezing guacamole is a fantastic way to take advantage of a sale, and to make a bunch of the good stuff at one time. 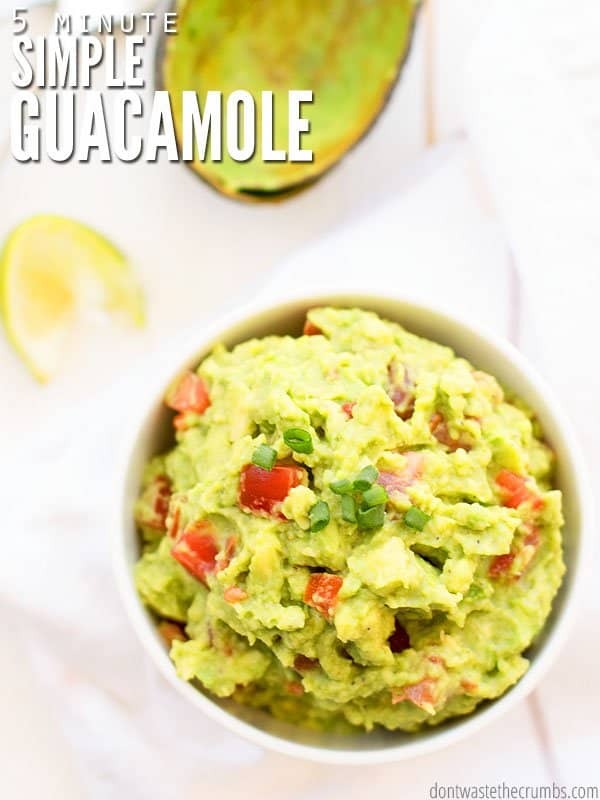 My friend Katie has a great method for doing this, but make sure you add your mix-ins AFTER you thaw the guacamole otherwise the texture will be off. Did you know you can make guacamole in your stand mixer? I shared awesome ways to use a KitchenAid Mixer, and using it to make guacamole is one of them. This is especially helpful if you’re making those bigger batches to freeze! Want to know how to keep it green? Have you heard ways to prevent your guacamole from turning brown, like storing it with the pit or covering it tightly with plastic wrap? Here’s the best way – add water! 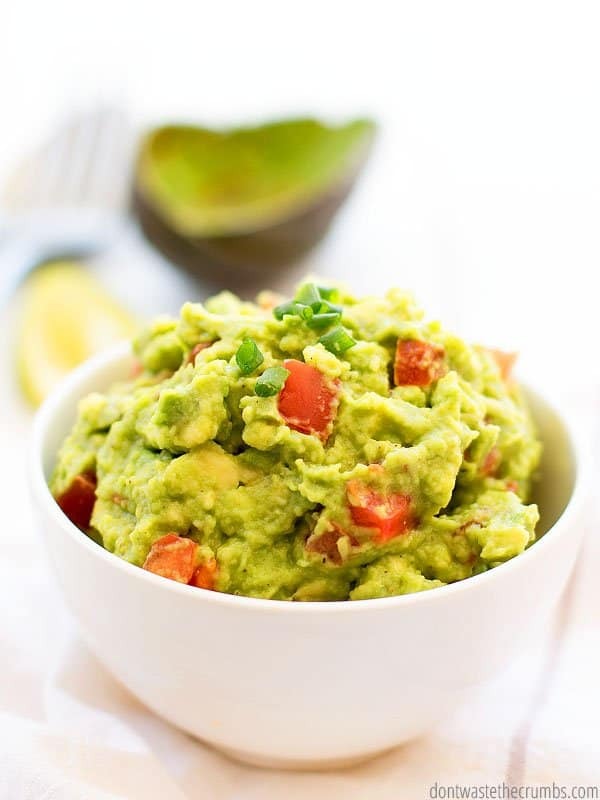 Yep – make your guacamole and smooth it out, cover it with a ¼” layer of water and store in the fridge for a day or more. When you’re ready to serve, pour off the water and stir well! 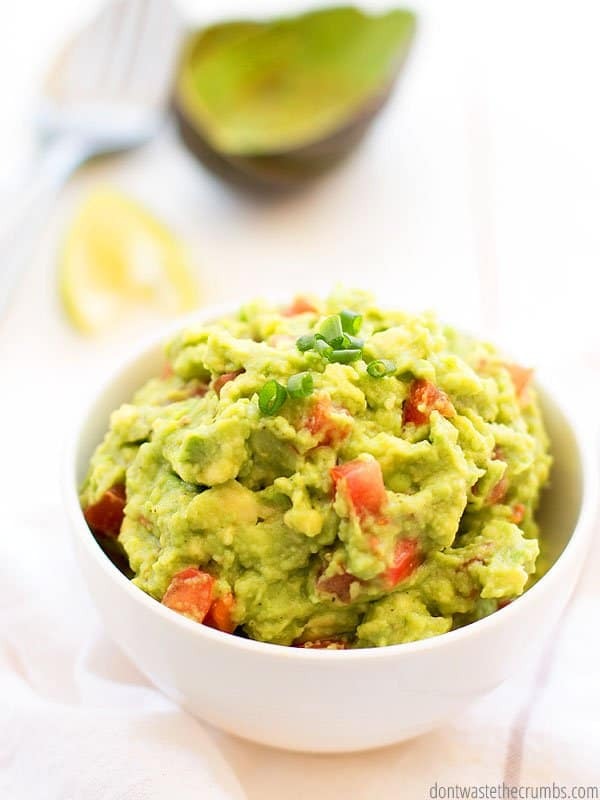 All you need to make this amazing guac is avocado, tomatoes, lime juice, and a few spices. Seriously. Its super simple! 5 minutes max. You can mix and match some add-ins to make it more to your liking if you have a little more time. Cilantro, onions, sour cream, salsa, jalapenos. All are tasty in guacamole. Simple is key when you are busy (and aren’t we all?) or when you need to keep the budget real tight. (Additional ingredients cost more money!) Find how to make Real Food Fast with this FREE 5 day challenge. Or if you’re ready to step it into high gear and makeover your grocery budget, Grocery Budget Bootcamp is the route to go. Add avocado to a stand mixer OR mash by hand until it's the consistency you like. Add the spices and lime juice and mix well. How do you like your guacamole? Chunky? Smooth? Mild? Hot? Any fun mix-ins you like to use? Leave your delicious ideas in the comments!